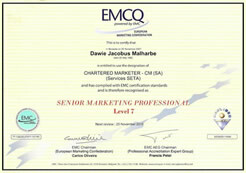 The Chartered Marketer is required to adhere to the Code of Professional Conduct, which is consistent in all material respects with the Code of Ethics issued by the World Marketing Association, and to participate in a Continuous Professional Development (CPD) program to maintain his/her name on the CM(SA) Register. "I have tremendous respect for his strategic insight into macro trends and his ability to see the big picture. He has a sound knowledge of the fundamental marketing principles as well as being up to date with the latest cutting-edge marketing trends..."
In 2004 MFSA’s Journal of Marketing interviewed Dawid Malherbe in which he shared his business philosophy and thoughts on marketing. 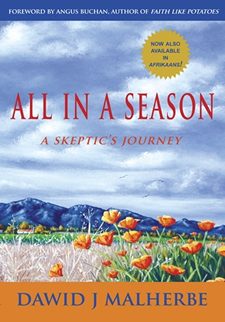 Dawid Malherbe wrote All in a season after his season with cancer to proof to skeptics that God is real and that He has a divine plan for all who calls upon His name! Cresta is Spanish for crest, ridge, crown, apex, top, peak, pinnacle or summit - therefore, we aspire to do business in a manner that will be a true reflection of the name … Cresta Marketing! Cresta Marketing strives to offer tailor made creative and strategic marketing solutions in an ethical, social and environmental responsible and sustainable manner. Cresta Marketing is a business consultancy committed to provide affordable and value-adding strategic marketing products, services and solutions. 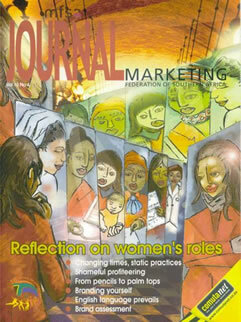 The busy executive who wants to make informed decisions on strategic marketing issues. Profit and not-for-profit driven institutions that lack resources to optimally address their marketing needs. SMME’s that do not have their own marketing department and/or marketing experts. Marketing professionals and leaders who want to keep their marketing strategies aligned to current global (and local) practices. 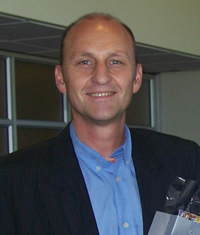 Dawid started out his marketing career with a Bachelor of Economic Sciences with Honors Degree and a Postgraduate Higher Education Diploma (1983 – 1987, University of Stellenbosch). From there he progressed to hold a variety of managerial positions gaining valuable exposure to corporate business, not-for-profit organizations, small-medium enterprises, and managing of big budget projects (e.g. Simonsvlei International, Paarl Vintners, Business Partners Mentors, Santam Insurance & Vredevol Trust). He also made important contributions in the field of tertiary education as lecturer, moderator and examiner in Marketing Management for 10 years (Stellenbosch College, IAC, Technikon SA & Cape University of Technology). Today he is an accredited marketing professional - Chartered Marketer (SA) 2001, and Senior Marketing Professional (EMC, Brussels) 2007 - with his business consultancy, Cresta Marketing, and lives with his wife and two daughters in the beautiful town of Franschhoek, South Africa.